The city of Edinburgh has always been a favourite place for the bus enthusiast to visit. The smart madder and white buses have been an attraction for many years. This video programme is a presentation of Edinburgh buses from the 1960’s to end of the first decade of the twenty first century. 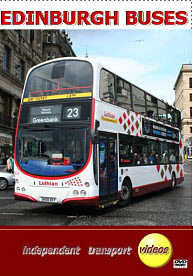 We concentrate mainly on the vehicles of Edinburgh City Transport, now operating as Lothian Buses. Many other operators serve Edinburgh from the erstwhile Scottish Bus Group to the likes of First and Stagecoach today. Vehicles can be seen from these fleets as well as the many sightseeing buses mostly in open top form, but we concentrate on the ‘Edinburgh’ ones. We start with some cine film from the 1960’s, unfortunately not of high quality, but considering the vehicles portrayed on it vitally important. Apart from the vehicles of the day it shows three demonstrators on loan to Edinburgh City Transport in the shape of A.E.C. Renown 7552 MX, Leyland Atlantean KTD 551C and Daimler Fleetline 565 CRW. Very rare footage indeed, that also includes brand new 101 (YSG 101) the three door Leyland Leopard, now in preservation. We then jump to some brief video shot in the 1990’s. The years 2002 and 2003 are covered with some re-edited footage which appeared on our ‘Scottish Weekend’ programme released in 2004, showing many Olympians in service along side the new order of the day – the low floor vehicles. Bringing the story up to date we show footage filmed in 2008 and 2009. By now the fleet is very modern, with the old madder and white livery almost disappearing and being taken over by the new ‘harlequin’ style. This still features some of the old shades! On the vehicle front most of the ‘step entrance’ vehicles have left the fleet, with only one appearing on the 2009 footage, the very last in service, being withdrawn a few weeks after we filmed it in action. Our final shots are at Ocean Terminal where there is a mock up of the new Edinburgh tram that is due to enter service in 2011/12, the shape of things to come! There is plenty of action for you to enjoy. It is fascinating to see the fleet develop over the years. Just for good measure we finish off with two Photo Galleries from our own archives, one covering 1974, the other 1984. So sit back and see five decades of Edinburgh Buses passing in front of you from your favourite armchair!